Be it your friend, sweetheart, sibling, or parents, there is a gift for everyone this Thanksgiving. And the best part is, it would not be a run-of-the-mill gift, but a very special gift that you can personalize for the person receiving it, and add your special touches to it. 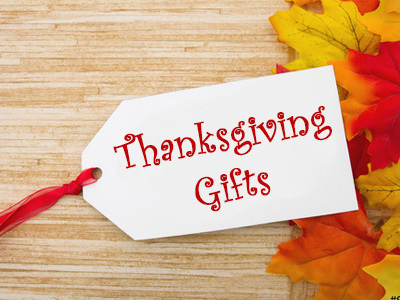 So browse down, and click to sending some very special, personalized gifts for Happy Thanksgiving. Make a lasting impression this Fall with our personalized Fall Leaves Embroidered Liner! Create a loving welcome for friends and family with this Personalized Half Round Doormat. Celebrate Thanksgiving holiday style with this Personalized Baby Clothing. Festive fall serving tray can be enjoyed year after year with any line of personalization custom printed. Dress up your home with bountiful selection of realistic pumpkins, custom made for your family! Custom personalized with any heading at the top and any name(s) at the bottom. Personalize your next movie night in with Personalized Bamboo Red Popcorn Bowls; perfect for the whole family! Decorate your home in fall style this season with Count Your Blessings Personalized Wood Sign. Count Your Blessings Personalized Waffle Weave Kitchen Towels are a must for your kitchen this season. Be thankful for all you have with this Personalized Bamboo Cutting Board. Kid's Apron is both fun and functional, made of white cotton canvas and custom personalized. This enchanting piece artfully displays any single initial, along with any name or address you choose. Custom personalized with any name in the athletic font as shown calling it yours alone! Now you can display a family photo for all to enjoy with Personalized Photo Frame. Initially Yours Embroidered Sherpa Blanket is so soft and snuggly, they won't want to leave home! Initial Impressions Moscow Mule Personalized Copper Mug will make a classic addition to any at home bar! What a charming gift for birthday, get well, housewarming, first apartment or chef's kitchen! . Family tree comes to life within the watercolor artwork that can be personalized with up to 18 names. Say goodbye to summer and celebrate the loveliest season of all with Autumn Hues Personalized Yard Stake! Capture and display your treasured family memories of a lifetime with this photo wall frame! Custom personalized with any name or message skillfully etched into the top of the bucket calling it yours alone! Hang in the foyer, the kitchen, at the front or back doors as a daily reminder of the Lord's blessings.